During Labor Day Weekend, I had the unfortunate experience of entering a mattress store. Casper was the first to disrupt traditional mattress sales by pointing out so much of what's wrong with legacy competitors, namely the intense sales pressure they apply. I was reminded of this in Sleepy's last weekend. When I walked into the store with my phone in my hand, the salesman's greeting to me was a dumb question about whether it was the iPhone or me that needed a mattress. I had glanced at my phone as I was walking in, but I wasn't buried in it the way stores should expect consumers to be today (especially when shopping for a product with a moving-target price). My mom firmly said she was looking for a mattress only -- no foundation. Not only did the salesman want to know what the foundation was, but then how old the box spring is. He was ready to push a new one on us and was disappointed to learn the box spring is brand new. Knowing we'd be shown the most expensive mattresses anyway, we asked to start with the lowest-priced ones. Despite the clear request ("lowest! "), the salesman asked at what price we wanted to start. Much of the total mattress selection in the store was down a narrow staircase in a low-ceiling basement. Always an enjoyable retail experience. The salesman smelled like smoke. I sat - despite pressure, I wasn't going horizontal on the suspect surface! - on one mid-priced mattress and said I didn't like it. Rather than ask "why" to better guide us, the salesman kept remarking that it was a "great mattress", "top mattress" and "very nice mattress" and reiterating the brand and style as if that spoke for itself. We said we'd think about the purchase and asked for the salesman's name so we could complete the transaction with him. He was miffed we weren't ready to buy after 6 minutes, yet repeatedly refused to provide his name (which presumably would've given him commission for the sale). He said he would be in the store the next two days and we should come back and look for him. 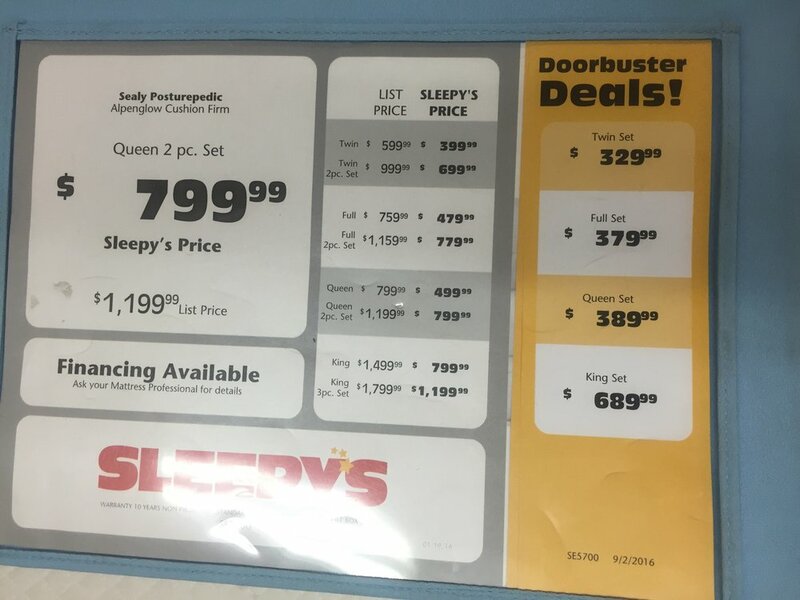 We found the mattress for a much lower price on sleepys.com but quickly learned the site has no BOPIS, reserve in store or store inventory check functionality. The delivery fee was a significant percent of the purchase price and the first available delivery date was more than a month away. We decided we'd pick up the mattress ourselves, but not from the store location that provided the aforementioned poor experience and grating salesman. So my mom called another nearby Sleepy's -- where the salesman who answered said he was busy and would call her back. He didn't call back. Even after she called twice more and said she was ready to place an order. 13. A visually unappealing price tag with more prices than one can count. 14. The model number is obscured enough to make competitive shopping or online transaction completion a nuisance. If Sleepy's and other traditional mattress stores have an advantage over start-ups in the space that are mostly online pure plays, it's their stores and the in-person experience they can provide. Which in this case was close to worthless.